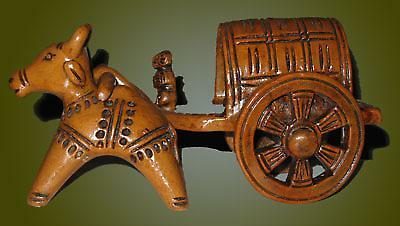 West Bengal is famous for its clay toys. Clay toys are also made in Jainagar and Rajgarh and Krishnanagar in Nadia district and in Shantiniketan. The features of Krishnanagar toys is that they are very sharp and beautiful where as the toys from Shantiniketan in Bolpur are very realistic. The designs are predominantly rural and have scenes and figures of the rural houses apart from temples and domestic animals. Clay Dolls, Clay Animal Figures huts and depict religious deities are commonly made. Making clay figures involves a lot of detailing and has been done using hand since ages. Once the moulds are made by hand, the toys are dried and then fired. The fired clay toys are then painted with bright colors. This is a hereditary art form. The toys are smooth and shine due to the application of an extract of tamarind seed.